Our thoughts are with all of woo! We are sorry that Qwill has gone to the Bridge. It sounds like he was quite a character. We send comforting purrs. Qwill....rest in peace, dear. purrrr....meow! We're so sorry to hear that Qwill had to cross the Bridge. We loved reading about him and our thoughts and purrs are with your mum and your family. I am so extremely sorry about precious Qwill. I know the exquisite pain of losing such a beloved family member. Love and comforting thoughts to your mother and to you. Qwill, I hope you were met by my little ones who went before me when you got to the Bridge. Rest in peace sweet one. Much love to your family. I am so very sorry to hear the news about sweet Qwill. My sisters and I send lots of purrs and hugs to your Mum. So sorry to hear about Qwill, I know he will be sorely missed. Our condolences to you and your Mom on Qwill's passing. He sounds like he was an incredible Cat, one in a million. Purrs and hugs from all of us at the Lounge. We're sorry Qwill has gone to the bridge. He sounds like a kitty we'd have really liked to know. Hugs, purrs and tail wags. So sorry to hear about Qwill. 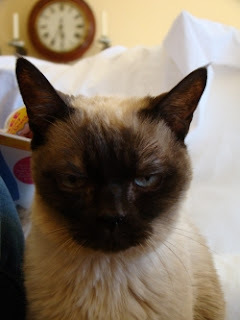 We maked a memorial on The Cat Blogosphere for him. Oh we are so sorry that Qwill had to run off to the bridge. He sounds like quite a character and was such a handsome guy! We are sending over tons of comforting purrs and prayers for your mum and the whole family. me is sorry to read about Quill! My companion Licety Split Went over the Rainbow Bridge 10 days ago and me misses him, so me knows how your Mom feels. me did not knows him, but we knows he was loved lots! Also, thank you for coming to my blog and following mes. me will follow you! I am so sorry for your loss my friends. We know Inigo will be waiting for him over the bridge. sending lots of purrs and healing hugs for mum and Annie. I remember it wasn't to long ago you mention he wasn't feeling up to snuff. I'm sure he has everyone hand feeding him fish, as the new emperor and waits for his family. Thanks for sharing your beautiful tribute to Qwill. We are so sorry to hear that magnificent Qwill had to go to The Bridge. What a lovely and touching tribute to Qwill! I will keep Qwill in my prayers. Sending all of you lots of love. Qwill is another wondercat that has left his people too soon. I lost my Patches on the 19th of NOv. She was like Qwill, the boss lady, the official greeter. I always leave room for her presence on the footstool where she loved to sit. I cry daily for her,she left us too soon. Be strong, I am trying to be. Sending snuggles and purrs to all that will miss Quill. Hope your memories will carry you through the difficult days ahead. Our purrrs and hugs are with you during this sad time!! Quill sounded like a beloved kitty and one who knew what he wanted!! I'm sorry to hear about Qwill. So sad news!I'm so sorry that Qwill went to the bridge.I'm sending all love and purrs to you all! We are sorry to hear about Qwill. We send you all comforting purrs because we know you are missing him so much. We are so sorry that Qwill has passed. We're sending our deepest condolences and purrs, wishing you all comfort and peace. We are so sorry to hear that Qwill has gone to Rainbow Bridge. We did not know him but it seems as though he was a larger than life character and we can only guess the size of hole he will leave in your hearts. We are sending gentle purrs to you all. Qwill had a good, long life on earth. He is running free at The Bridge now. We are sending tons of purrs and purrayers to you and yours during this difficult time. I'm sorry to hear about handsome and proud Qwill. We had so many beloved Siamese kitties growing up. R.I.P Quill, may you find joy and all the hand fed fish you can handle and dogs to yargle yow to. Rest in peace, Qwill. He sounds like a really cool dude! We are deeply sorry for the loss of your beloved Qwill. What a character, he graced you with such devotion for 18 short years. We send you our purrs to help heal your broken heart. Qwill sounds like a character and we know he will be missed bunches. Your love for him shows in your post. Our deepest sympathy for your loss. It sounds like Qwill was a perfect Siamese. We are so sorry for your loss. Ik weet siameesjes zijn erg aanhankelijk. Wat zal hij gemist worden. We are so sorry to hear about your mum's cat! Quill sounds like he was quite a character, I know you will miss him terribly. We were so sorry to learn Quill had to run to The Bridge. He will be waiting for your Mum when it is her time to leave...my Mom knows this for a fact. Hope you and yours have a nice weekend! So sorry to hear about Qwill, it is heartbreaking when we lose such a good friend. He sounds such a wonderful character. I am very sorry for him having gone to Heaven .. is another star in the universe.